Adjustable Colorful Bead Stainless Steel Bracelets 12 Pc Set Only $11 Shipped! You are here: Home / Great Deals / Adjustable Colorful Bead Stainless Steel Bracelets 12 Pc Set Only $11 Shipped! Nothing says picture perfect than a wrist wrapped in arm candy! This Adjustable Colorful Bead Stainless Steel Bracelets 12 Pc Set is Only $9 plus $2.00 Shipping! 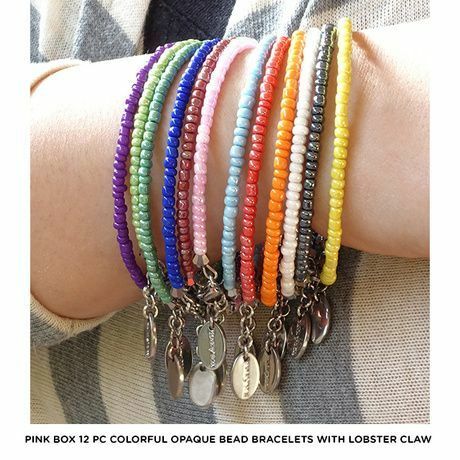 They’re fun, fashionable, and absolutely eye-catching with each colored bead creating a rainbow effect on your arm! Available in your choice of Frosted Bead Bracelets or Opaque Bead Bracelets.